A field of volcanoes you have never heard of will wake up, and if it fulfills its geologic potential, the consequences will be heard around the world. Placid, beautiful, mysterious: The Laguna del Maule caldera is all of these today. When will it wake up and reveal the molten rock that is driving one of the most active volcanoes on the planet? Curiously, Laguna del Maule, situated along the spine of the Andes, doesn’t even look like a volcano. No towering peak, no plume of smoke or steam, no stench of sulfur. But 36 times in the past 20,000 years, volcanic vents surrounding the lake basin have created monster fields of lava — with huge deposits of volcanic glass, pumice and ash. Once, almost a million years ago, this volcano field had an eruption that, if repeated, could change history by affecting air travel, agriculture and climate. Tantalizing scraps of lava indicate other enormous eruptions 1.5 million and 336,000 years ago. 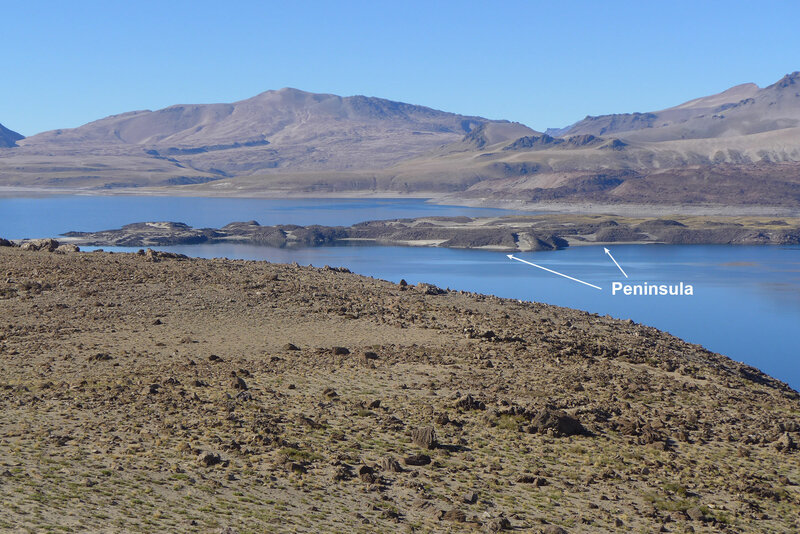 This peninsula, formed during a lava flow 24,000 years ago, is near the center of uplift today — and therefore likely a marker for a growing chamber of magma. It’s a maxim of geology: What happened before can happen again. Brad Singer explains the role of rock samples in understanding the volcanoes at Laguna del Maule. Other causes for concern include swarms of earthquakes, horizontal spreading, spreading faults, and new detections of carbon dioxide gas that likely signal the enlargement of the underground magma pool that powers the volcano. Eruptions can be ranked by estimating the volume of volcanic ash (mainly tiny shards of glass) they release. In 1980, Mt. St. Helens released about one cubic kilometer. In 1991, Pinatubo in the Philippines sent more than 10 cubic kilometers; its ash and sulfur gas injected into the upper atmosphere cooled the planet for two years. 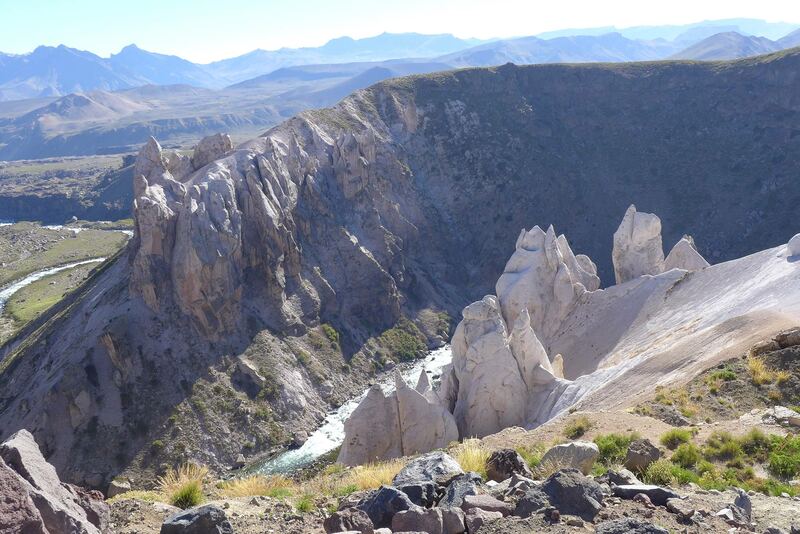 About 950,000 years ago, an eruption at Laguna del Maule spewed dozens of cubic kilometers — perhaps more than 100. The eruption blanketed Argentina, downwind, with ash. 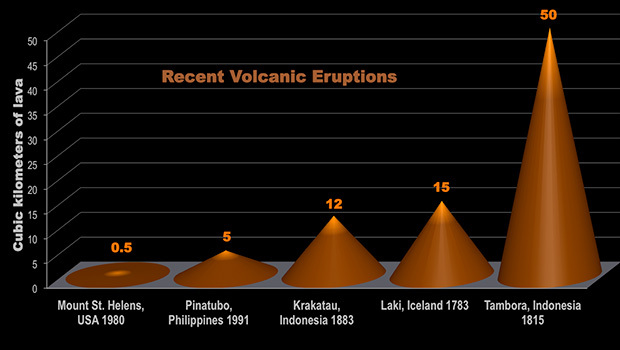 The bigger the eruption, the less common it is. Laguna del Maule could go back to sleep, or (rollover) enter the history books as the largest eruption in recorded history. A 100 cubic-kilometer eruption could cause global cooling, and intense damage to agriculture could affect the entire globe. Because the only people around Laguna del Maule are the horsemen who drive cattle in the summer, the immediate human impacts will be limited — unless giant flows of hot rock or debris reach Chilean cities. But dense ash-fall during the growing season could devastate agriculture in Argentina, to the east. Just 50 kilometers north of Laguna del Maule, a similar volcanic field, called Calabozos, has had three super-eruptions in the past million years, spewing about 1,000 cubic kilometers of ash in total. Those eruptions rank among the largest in a million years. Laguna del Maule, a massive volcanic complex in Chile, could change the planet, with an eruption like three giants at nearby Calabozos. 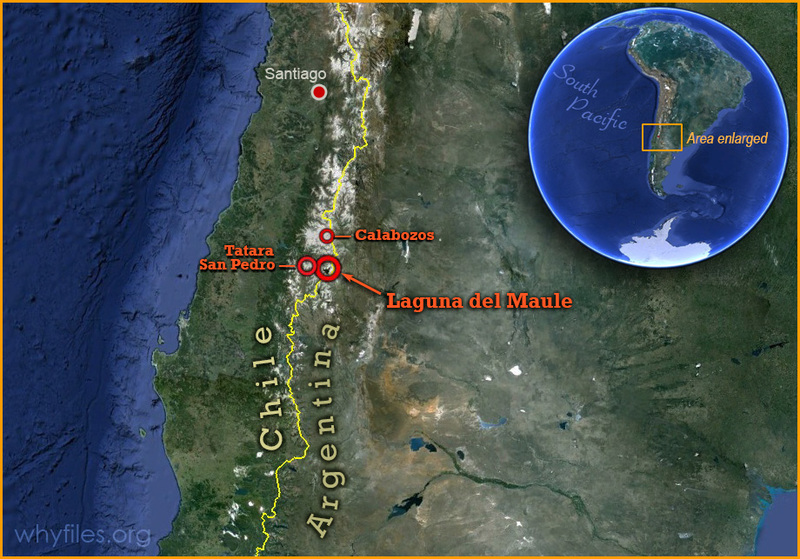 Maule could be returning to life. How dangerous is that? The immediate cause of concern at Laguna del Maule comes from radar satellites and the global positioning system, which show that 1.5-meter rise in six years. The accelerating uplift is almost certainly due to new magma entering a pool located five kilometers underground. Volcanoes are fed by molten rock, or magma, located deep underground. A weak spot in the crust allows magma to reach the surface, where the rocky products are called lava. In places like Laguna del Maule, silica-rich lava holds vast amounts of water. When pressure drops, this water flashes to steam; the rapid expansion of volume drives explosive eruptions. 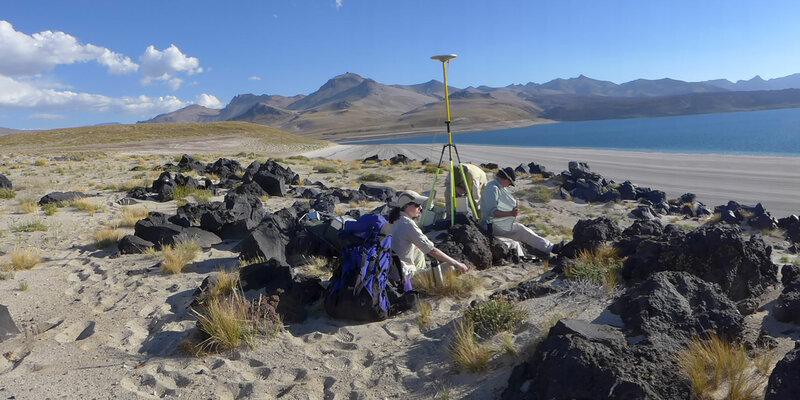 In 2013, with support from the National Science Foundation, UW-Madison geoscientists began a field campaign to gather more basic data on Laguna del Maule. A caldera is a ring-shaped structure formed when by collapse when a giant pool of magma is vented to the surface. Humans have seen the aftermath of super-eruptions, but never the eruption itself, which may disgorge a million tons of rock every second. If the past is a reliable guide, super-eruptions can change the planet. 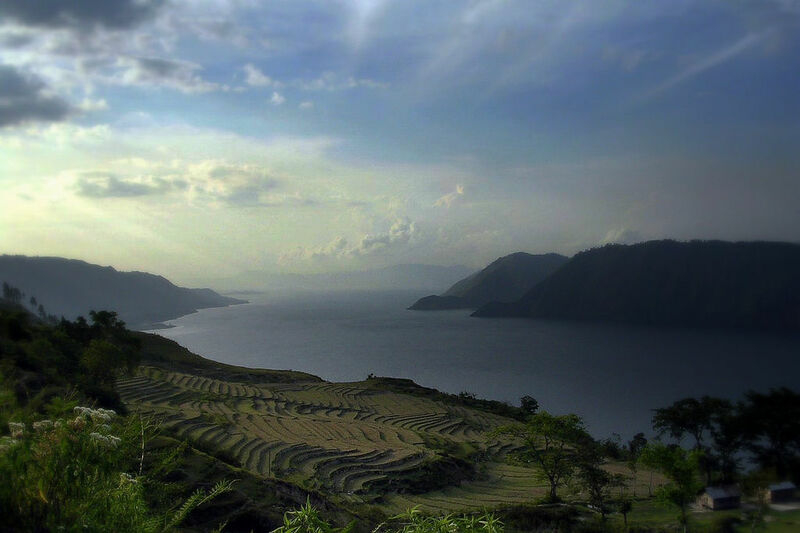 The caldera at Lake Toba, in Sumatra, Indonesia, formed during a stupendous super-eruption about 70,000 years ago. In its last eruption (so far!) the volcano released about 2,800 cubic kilometers of lava and ash! “Volcano” and “prediction” are not words that geologists like to join together, but the essential goal at Laguna del Maule is to understand the situation well enough to answer a simple question: How likely is an eruption that would be large enough to affect the region or the planet? How much do we need to worry? Dating techniques can tell when magma cooled at the surface, revealing the “pulse” of eruptions. Mineral analysis can assess the physical conditions before previous eruptions, and suggest how changes in the magma trigger eruptions. Seismology uses earthquakes and explosions to define the shape of underground structures. Gas measurements offer clues about the type and volume of magma under the volcanic field. Electrical and magnetic measurements outline the shape of a magma chamber. 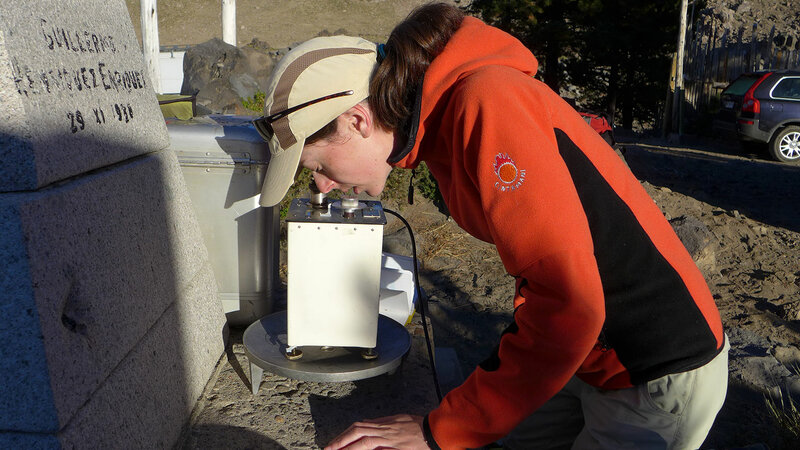 Gravity meters can detect changes in the volume of magma at depth. Eyeballs, a venerable tool of geology, can see faults, uplift and lava from past eruptions. These techniques gain precision if their data are merged, Singer says. Many methods “can give a fuzzy picture of what’s down there, but the more techniques you can bring to bear, the more you can tighten up the boundaries between different materials” and so get a better picture of the magma and its potential routes to the surface. Brad Singer (left) advises UW-Madison graduate students Nathan Andersen and Erin Birsic, as they hunt for rocks of a certain age for Birsic’s master’s thesis. She is focusing on remnants of a massive eruption from 950,000 years ago, but after millennia of erosion those rocks are scarce. If you need a date, Singer is a good guy to know, at least if you want to date rocks. A specialist in geochronology, Singer uses sensitive instruments to squeeze out a date of formation for igneous rock, meaning when the rock solidified from cooling magma. The overall goal at Maule is to tease out the timing of the many lava flows in the basin. One dating technique relies on the radioactive decay of potassium into the gas argon, which follows a schedule set by the half-life of the isotope potassium-40. Magma is hot, and any argon present will diffuse into the crust, but argon is trapped after magma cools into lava at earth’s surface. “Once it cools past a certain point, then argon stops diffusing, allowing argon produced from radioactive decay to build up,” says Nathan Andersen, a Ph.D. student in geoscience at Wisconsin who is dating recent lava flows at Maule. Potassium-40 decays into argon-40, and so counting each isotope becomes the foundation for calculating the date of cooling. However, potassium decays slowly, and this system has yet to date recent flows at Laguna del Maule, which are apparently younger than 2,000 years. High-tech is eye-catching, but once you know what you are looking for, eyesight offers insight. Look at the large granite intrusions underneath Tatara San Pedro, a nearby volcano. The granite is apparently the remains of a magma chamber which cooled about 6 million years ago. The express elevator that is raising Laguna del Maule can be seen with the naked eye. White streaks on certain parts of the shoreline contain diatoms and ash that were deposited in the lake. “These are a sign that the uplift has been going on for many centuries,” Singer says. 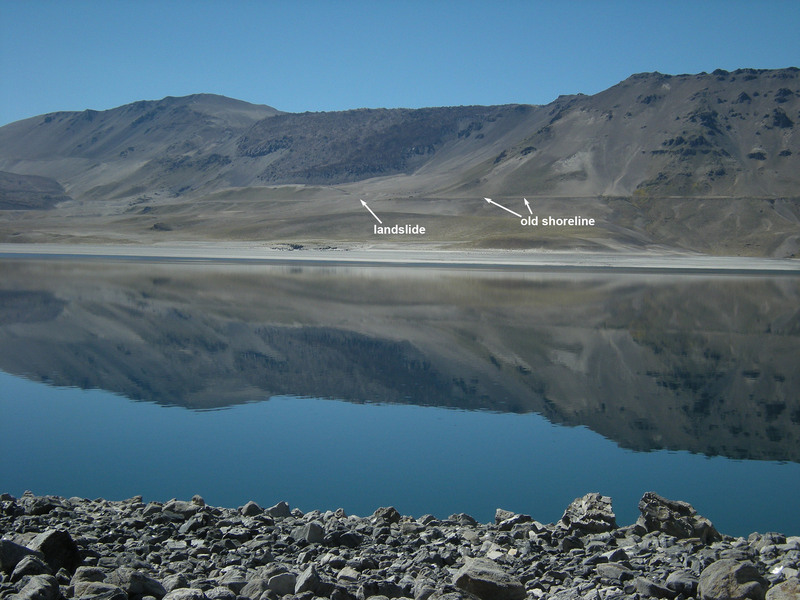 Laguna del Maule was much larger 19,000 years ago; then the lake level dropped after a lava dam broke. Black arrows show traces of the old shoreline; blue arrows show a landslide that occurred since the sudden drop in lake level. The lake bench, 200 meters above the existing lake, shows an old shoreline that, when formed, was as horizontal as the lake itself. Singer suspects that the profile of the bench carries a long-term record of uplift. Faults, which show how adjacent sections of rock have moved against each other, are another eye-catcher. Last year, the Wisconsin scientists found new evidence of horizontal spreading and faults; these structures show earth movement, and could facilitate the rise of magma and an eruption. The Laguna del Maule landscape is steadily changing. The white scrap of cooled magma (foreground) is the eroded remains of a massive lava flow. The rock originated as a pyroclastic flow; a fast-moving, red-hot material that cooled after being deposited, probably about 19,000 years ago. Finding chemically similar lava over such a large area indicates that a large eruption is possible in the future. When the earth moves, the resulting vibrations convey clues about the planet’s internal structure. Both earthquakes and deliberate explosions can produce a “CAT scan of the crust,” based on how waves are transmitted, reflected, absorbed or converted into different waves, says Clifford Thurber, a seismologist at UW-Madison. P, or “primary,” waves resemble sound waves, with zones of compression and decompression. S, or “secondary,” waves, are a bit slower, and travel rather like a slithering snake. 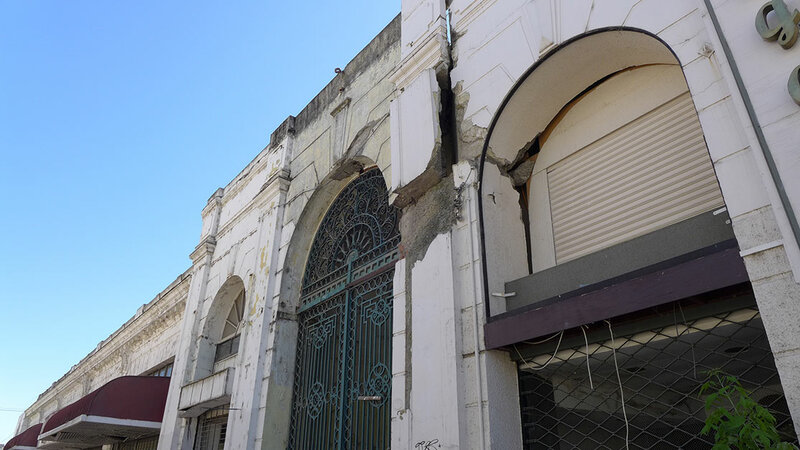 This building in Talca, Chile, was destroyed by the magnitude 8.8 Maule earthquake in 2010. This, the sixth-largest quake ever measured, killed 525 people. After a swarm of earthquakes in March, 2013, scientists at the Chile’s Southern Andes volcano observatory issued a yellow alert, indicating that an eruption was possible in weeks or months. Thurber is introducing state-of-the-art computer analysis of seismic waves that will pinpoint arrival times more precisely. With improved earthquake locations, “We can do a better job of clarifying the structures that produce the earthquake,” Thurber says. 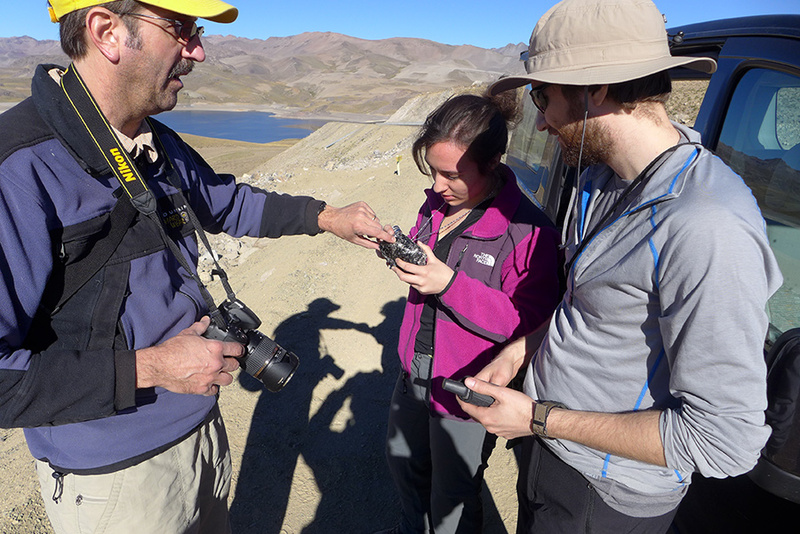 Glyn Williams-Jones explains the significance of carbon dioxide measurements at Laguna del Maule. Volcanoes can release staggering amounts of gas: Mt. Pinatubo coughed up an estimated 20 million tons of sulfur dioxide. despite difficulties with two brand-new carbon dioxide meters, Glyn Williams-Jones, a volcanologist at Simon Fraser University in British Columbia, did find some elevated levels along the lakeshore in 2013. “That means there is basalt entering the magma chamber from below,” says Williams-Jones. Newly arrived, extremely hot basalt could interact with the existing rhyolite magma and boost the odds of eruption. Helene Le Mevel, a graduate student, adjusts a meter that measures the local gravity field with astonishing precision. If significant amounts of magma are rising underground, gravity should be weaker in next year’s measurements — if the measurements are precise and accounts for the ongoing uplift of the area. To get a better sense of what’s happening under ground, geophysicists can measure electrical currents and magnetic fields inside Earth. “The surface is bathed by electromagnetic radiation from the sun, and there is an electrical response at depth,” says Singer. The technique, called magnetotellurics, is used in geothermal energy exploration, and an energy company has already used it to find a shallow steam field just west of the caldera that could power a geothermal electric generator. Magnetotellurics has already revealed that the crust around Laguna del Maule is about 40 kilometers thick, and that the magma body is about 5 kilometers below ground, Singer says. 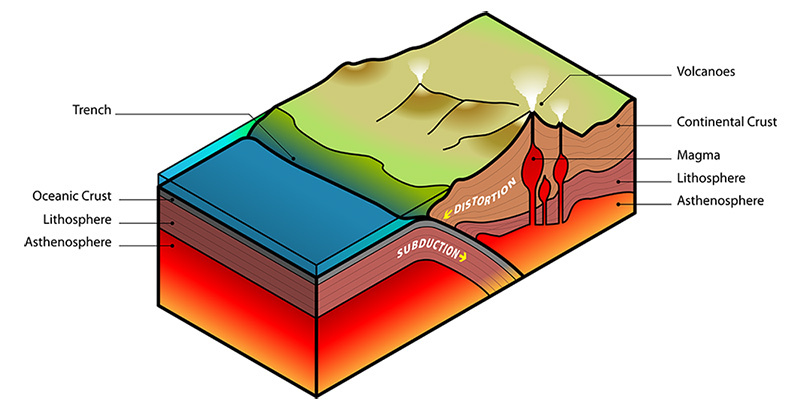 In the future, the technique could help define the size and location of melted crust near the magma chamber. Accurate measurements of gravity are another telltale about changes in the hot, molten magma. Because matter expands as it warms, magma is 10 percent less dense than surrounding rock, explains Basil Tikoff, a UW-Madison specialist in large-scale structure of the Earth, such as faults, old mountain belts and tectonic plates. Basil Tikoff of UW-Madison explains the role of the gravity meter. The pull of gravity decreases as the instrument gets farther from the center of the Earth. “This instrument is so sensitive that if we went up a few stairs, you could tell,” Tikoff says. Therefore, Laguna del Maule’s pervasive uplift must be mathematically removed from subsequent measurements. Baseline measurements taken in March and April will serve as reference points for subsequent surveys early in 2014. Located at the crest of the Andes, Laguna del Maule will be impassable until then due to its astonishing snowfall. Laguna del Maule is a contradiction. To people who would be affected by a large eruption (which could include all of humanity in a super-eruption) it’s a threat. Gravimeters must be protected from vibration due to wind. Graduate student Tor Stetson-Lee blocks wind as Basil Tikoff measures gravity on the east shore of Laguna del Maule. That flying-saucer-on-a-stick is a GPS receiver able to measure altitude in millimeters. The rapid uplift, combined with swarms of small earthquakes, apparent releases of carbon dioxide, and spreading of faults cannot go on forever. If they continue, the magma’s upward pressure will eventually exceed Earth’s ability to contain it. Then Laguna del Maule erupts.